The Long® engine-mounted engine oil cooler improves engine performance and durability through superior cooling properties to reduce thermal load. This reliable oil cooler is commonly used on high-speed diesel, gasoline or flex fuel engines for light trucks needing engine oil cooling capacity. Our design also works well for newer, more efficient engines that require engine-mounted oil coolers. 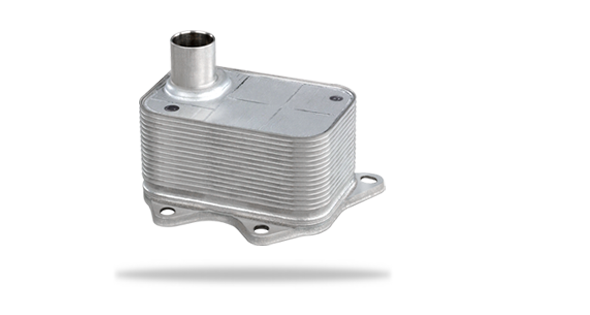 Mounted directly onto the engine block, oil leaves the engine and enters the oil cooler to circulate throughout, before exiting and re-entering the engine. The cold mixture of glycol and water can be fed from the radiator circuit through flexible lines, or directly into the heat exchanger from the engine block, which eliminates the need for additional lines. When the hot oil and cold fluid have the greatest inlet temperature difference, optimal performance is achieved to enhance durability.